This is an amicable picture of two ”popular” musicians from the Golden Age of tango: directing orchestras wasn’t just about hard work and facing fierce competition, it seems that many people involved were friends or at least pretended they were, posing for some camera like below. One of the goals of this blog has been to show a more ”human” side of all the major musicians whose music we still dance to today: and varying from the two men below with their very natural look to Canaro, Lomuto and Firpo being children again for a moment, I definitely think there is some progress for that goal. 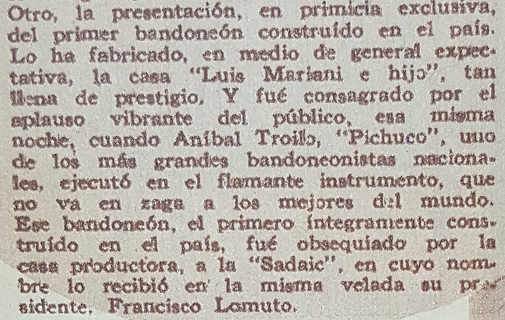 Interestingly, the caption for this picture claims that Ángel Vargas, D’Agostino’s classic partner, rejoined the orchestra after a number of weeks of probably trying to become a soloist, which happened in 1943, when there was a trend towards opting for a solo career, with popular singers like Alberto Castillo setting the example. Indeed, when we look at the chronology of D’Agostino’s recordings, Vargas went missing for a while, with a few tracks sung by someone else. Fortunately, Vargas changed his mind and the famous duo kept recording together for a few more years.